One of the features that I love about Mac OS X Leopard is the ability to set up multiple desktop workspaces which are called Spaces. Spaces are a huge help when trying to manage lots of windows at the same time or when working on multiple projects at once but wanting to keep them separate. My favorite way to use Spaces is to run Windows (using VMware) in one Space while using OS X in another. Now Microsoft has taken notice of the benefits of Spaces and is offering a free program called Desktops that allows you to do the very same thing in Windows. In this tutorial, I would like to show you how to use it. 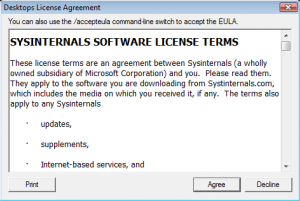 Double click the Desktops application and you will be presented with a License Agreement. Once accepted, you will be presented with the settings screen. 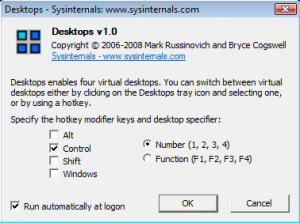 Here you can choose which key combination you would like to use to switch between the different Desktops. Also, be sure to check “Run automatically at logon” so Desktops starts when Windows starts. Click “OK” and now you can start using your multiple Desktops. You can start switching between them by using the key combination you chose or by clicking on the Desktops icon in the system tray. 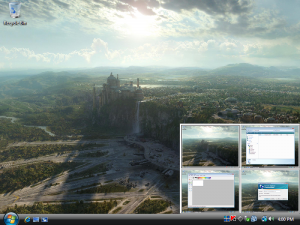 When clicking on the Desktops icon in the system tray, you get a visualization of what each Desktop has and you can choose it by clicking on them. All in all, this is a great little app to use for multitasking. If I had any complaints it would be that you can’t choose how many Desktops you want and are limited to four. Maybe a future release will add this function. Can you configure it to switch virtual desktops using the scroll wheel? If not, that would be useful. And why did it take Windows and OS X this long to get virtual desktops working? The Amiga had them in 1985, and Linux/X has had them for years as well. I consider it *the* most helpful graphical utility, at least as powerful as the ‘window’ concept. Not only that, but it’s probably easier to implement than a task bar. Unfortunately, you can’t configure it to switch using the scroll wheel yet. Hopefully, that will be in a future release. And yes I agree that I’m not sure why it took them this long. That is why I have always enjoyed using Linux because both Gnome and KDE have had this feature as long as I can remember. Is this a XP and Vista tool? How does it work with multiple monitors? Oh, and welcome back. This is a standard feature in Ubuntu Linux with CompizFusion… always a better alternative to Windoze! 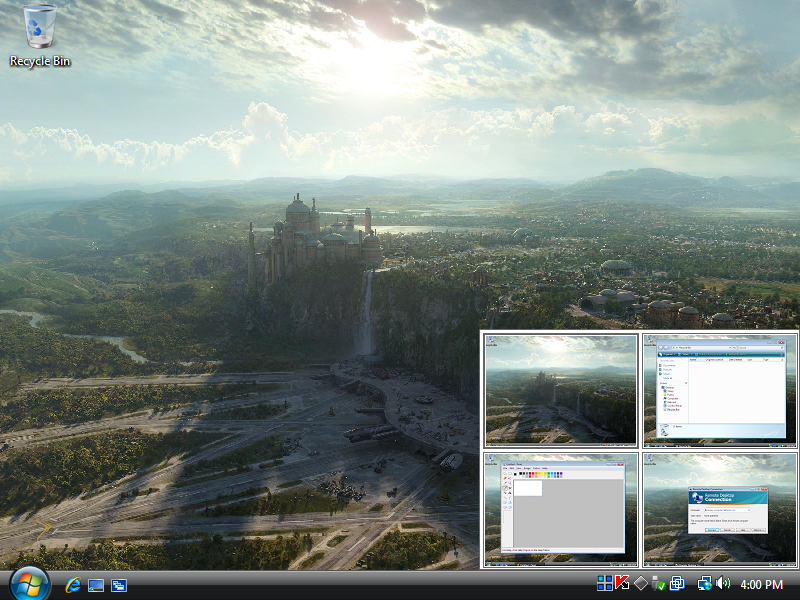 Multiple workspace is my favorite feature on Linux, now I can also do this on my Windows. Thanks for sharing this, keep on with cool stuff. 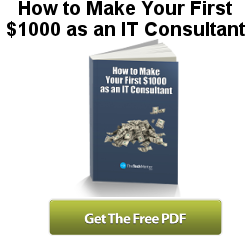 Does anybody know if antispyware/virus software is carried over to the other desktops? Yep. Even though it doesn’t show up on the other desktops, it’s still running in the background. OS X Leopard didn’t introduce workspaces as you so erroneously imply with the very first sentence of this article. It’s been a standard feature for X-based Window Managers for decades. Linux and BSD have had it long before Steve Jobs even had a clue what UNIX was. Thanks for your comment but I didn’t say anything about OS X “introducing” workspaces in my first sentence as you have erroneously implied. I simply stated that it is one thing that I loved about Leopard. I can tell from your comment that you are obviously a Linux/Unix fan which is great. I love Linux too. However, this article is not a debate about which OS is the best, it’s simply a how-to if you want to set up spaces in Windows. Mine is not allowing me to have the same program running in multiple desktops, is this normal? Does this not allow me to open one internet session in one desktop, and another in another? The beauty of spaces on the Mac was to be able to have the same program open in different workspaces. It also is nice on the Mac to be able to drag the window over to the side and have it move to the next space. Can you have the same program open in two? I am trying to open some PDFs in one space, and some in another.